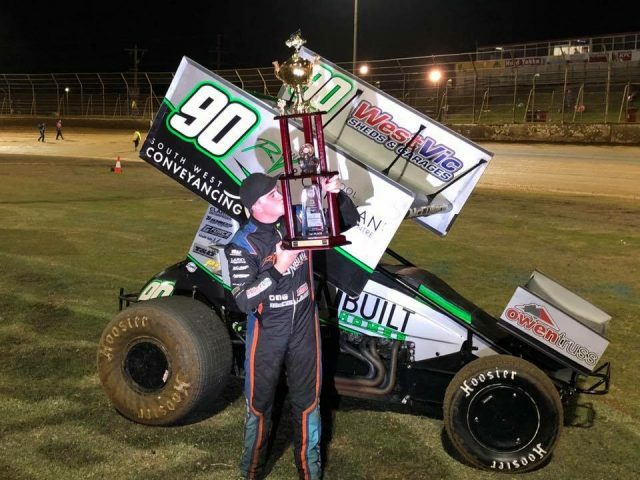 Little-known Warrnambool go-karter Corey McCullagh has won the Grand Annual Sprintcar Classic in arguably the greatest upset in Australian speedway history. In a result that has wowed the sport, McCullagh drove from ninth on the grid past a bunch of his heroes to become the 25th different winner of the Classic. After claiming Australian speedway’s greatest prize, the youngster performed a series of celebratory doughnuts before being mobbed by his gobsmacked team. The capacity 12,000 strong crowd at Warrnambool’s Premier Speedway gave the local a standing ovation in one of the Classic’s great moments. “This won’t sink in until next year, holy hell,” McCullagh told Speedcafe.com. The budget racer, who delivers bread for a living, collected the $30,000 prize for the biggest victory of his career. “We’re only a low budget team; I just told myself in those last 10 laps it was just an SRA show so I wouldn’t crack under the pressure,” McCullagh said. American Carson Macedo and pole sitter Brooke Tatnell completed the podium. Former Classic winners Kerry Madsen and Steven Lines were fourth and fifth. Madsen will defend his National title at the Australian Sprintcar Championships beginning on Thursday (January 25) at Mount Gambier’s Borderline Speedway.